Cloud recording is automatically enabled for all paid subscribers. When you record a meeting and choose Record to the Cloud, the video, audio, and chat text are recorded in the Zoom cloud. The recording files can be downloaded to a computer or streamed from a browser. To manage your recorded meetings or share a recording with others, log in to your account and navigate to the My Recordings page. Zoom also offers local recording, which saves the recording files to your computer. Note: An email alert will be sent to account owner when usage is at 80% of the subscribed storage limit. Navigate to the Recording tab and verify that the Cloud Recording setting is enabled. Note: If the setting is disabled, click the toggle to enable it. If a verification dialog displays, click Turn On to verify the change. This will allow Pro users to enable Cloud Recording for their meetings. Account owners and admins can disable the download feature for recordings on the account by turning off the Cloud recording downloads on the Account Settings page. If the setting is disabled, click the toggle to enable it. If a verification dialog displays, choose Turn On to verify the change. If the option is grayed out, it has been locked at the account level and will need to be changed. Sign in to the Zoom web portal and click My Meeting Settings (if you are an account administrator) or click Meeting Settings (if you are an account member). If the option is grayed out, it has been locked and must be changed at either the group or account level. Contact your Zoom administrator for assistance. After enabling cloud recording, you can change these settings. These settings can be applied at an account, group, or user level. Record active speaker with shared screen: Record both active speaker view and shared content on the same video. Record gallery view with shared screen: Record both gallery view and shared content on the same video. Record active speaker, gallery view and shared screen separately: Select the layout types that you want to record as separate videos. 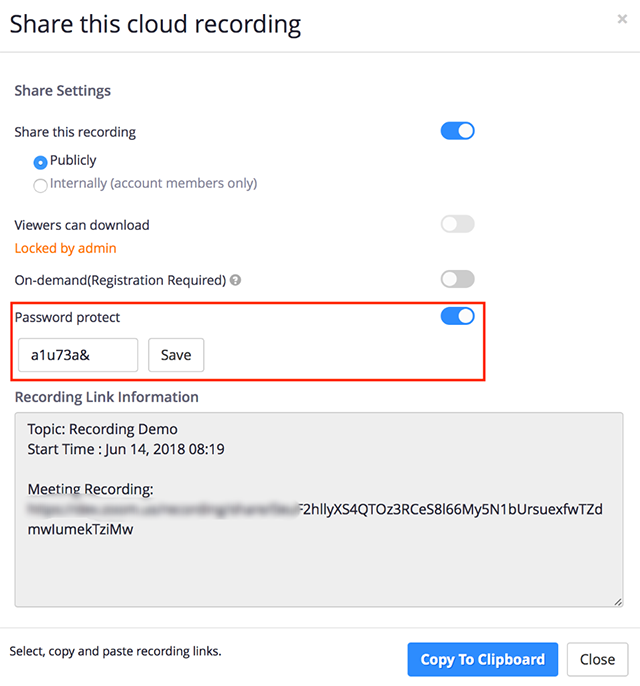 Note: By selecting this file type for cloud recordings, you will see the shared screen recording beside the active speaker / gallery view when viewing a cloud recording using the Zoom web portal. Learn more about recording layouts. Audio Only: Receive an M4A file with a recording of the audio only. Chat Text: Receive a TXT file with the transcript of in-meeting chat messages. Add a timestamp to the recording: Add a timestamp of the meeting to your cloud recordings. The time will display in the host's timezone, set on their Zoom profile. Display participants' names in the recording: Add participants' name to the bottom-right corner of their video. Record thumbnails when sharing: Include a thumbnail of the presenter when screen sharing. Optimize the recording for 3rd party video editor: Generate your cloud recording video files with a standard format that is compatible with 3rd party video editors. This may increase file size. Audio Transcript: Automatically transcribe your cloud recordings. Note: Only hosts and co-hosts can start a cloud recording. If you want a participant to start a recording, you can make them a co-host or use local recording. Start a meeting as the host. Click the Record button in the Zoom toolbar. Select Record to the Cloud to begin recording. To stop recording, click Pause/Stop Recording or End Meeting. Once the recording has been stopped, the recording must be processed before viewing. Zoom will send an email to the host's email address when the process is completed. For recording on mobile, see Recording on iOS and Android. You can record the meeting in different layouts including active speaker, gallery view, and shared screen. Learn more about recording layouts. Log in to the Zoom web portal and navigate to My Recordings. Note: If your meeting has not finished converting, the recording will show in the list with a Processing Recording label. Once the recording has finished converting, you will be able to view, share, download or delete your cloud recording. Shared screen with speaker view: MP4 file with audio and video showing both active speaker view and shared content. Shared screen with gallery view: MP4 file with audio and video showing both gallery view and shared content. Active Speaker: MP4 file with audio and video showing the active speaker view only. Gallery View: MP4 file with audio and video showing the gallery view only. Shared Screen: MP4 file with audio and video showing the shared screen only. Audio only: M4A file with a recording of the audio. Audio transcript: VTT file with a transcript of the audio only. Chat file: Text file with the transcript of in-meeting chat. Click a file to play the recording or see the text of the chat. You can also download, share, or delete recordings. (Optional) If you want to trim the recording of a shared video so that it starts and ends at the times you specify, you can set a playback range. See Cloud Recording Playback for details. Since cloud recordings are store online, you can share a link and allow others to view your recording. Locate the meeting topic on the My Recordings page. Click Share in the last column of the recording you want to share. Click Copy To Clipboard to copy the public link. Share this meeting: Select Internally (account members only) to only allow account members to view or download the recording. Viewers can download: Turn off the toggle if you do not want views to be able to download the recording. On demand (registration required): Require visitors to fill out a registration form before viewing the recording. Password protect: Require visitors to enter a password before viewing the recording. Click Share next to the recording you want to password protect. Enable Password protect by clicking the toggle. Enter the password you want to use and click Save.